TeKu Glass Review – Is It Really The Best In The World? You are here:Home Craft Beer TeKu Glass Review – Is It Really The Best In The World? Since I've been stocking my cabinets with all the great beer glasses I can find, I couldn't resist buying the enigmatic and enchanting TeKu. Advertised as the best beer glass in the world, I had to try it. It was a bit on the pricey side, but for something that you can use over and over again, it was an easy buy decision for me. 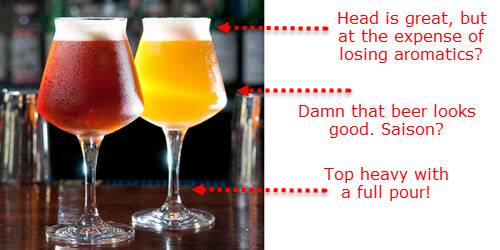 Last week I did a review of the IPA glass from Dogfish Head and Sierra Nevada. I also did one for the porter glass from Left Hand + Rogue. This week I want to review the TeKu glass so you can see if this is something you really need to add to your collection. After all, a glass is a glass, right? The most obvious attribute of this glass is the unique shape. Chances are, you've never seen one in real life unless you are around beer nerds with money. Even fancy beer joints serve just about everything in a pint glass, a tulip glass, or a taster. In fact, the first time I saw this on Amazon I thought it was mislabeled…that's not a beer glass! What they've created is simply an attractive glass. There's no doubt about that. Some craft breweries are jumping on board and coming out with their own branded TeKu glasses. A few are sold online, but are hard to find, while some are only used/available at the brewery. I got the plain ones because all my pint glasses are branded so I like to have my specialties ink-free. I think it helps with the photos as well. The funny thing about this glass is that the ‘drink' of the beer really does feel different as you put the glass to your lips. The shape of the mouth of the glass is unlike any other, and the soft, round edges seem to be designed for a pleasurable drinking experience. 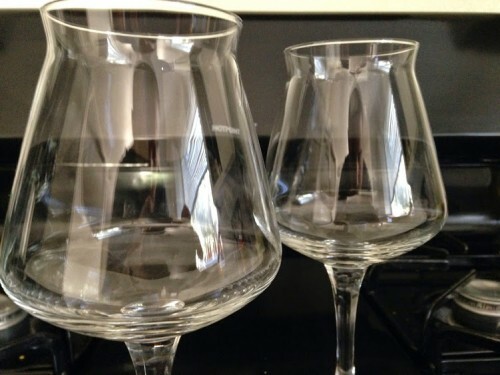 The stem of the glass provides a tasting experience, much like with a wine. I find that the glass feel a whole lot more ‘stable' when only 1/4 – 1/3 of the glass is filled. Holding the glass at the stem with a full-to-the-brim glass of beer is a balancing act. Actually, I don't know why the glasses shown in the advertising picture are filled that full because I feel like this glass does so much better with less liquid in it. Filled only part way, you have more room for head, can get your nose in there for a full aroma experience, and it allows for a nice tilt as your drinking rather than trying to sip it from a glass that's too full. Gripping the bowl of the glass is a bit awkward, maybe because I'm just not used to the shape and am somehow still expecting the round feel of a wine glass. I actually think this glass does much better with higher alcohol beers, or at least beers that you want to sip rather than drink. That might be obvious by the size of the glass, but still, as I mentioned above, I feel the sensory experience is enhanced if you can get a bit of your face in the glass as you drink. Supposedly, the shape of the TeKu is supposed to enhance the complexity of the beer. Perhaps they mean in a general way because it's a new sensory experience altogether, having a new shape of glass. Best beer glass in the world? I don't think so. I wouldn't drink any session beers out of this including porters, lighter IPAs, or stouts. I think some of the Belgian beers that do well in tulips would do well here too, but then, why not use a tulip? In my opinion, these glasses were made for high gravity beers and maybe sours: Double IPAs, Imperial Stouts (imperial anything, really), and dopples/tripels/quads. Lambics, Berliner Weisse, Flanders red/brown, and brett inspired brews. Oh, and anything barrel aged deserves the touch of ‘class' that TeKu provides. So although they are not the “best” in the world, I do think they are the most beautiful, and they absolutely have a set of beers they are not only appropriate for, but can also enhance the sensory experience. 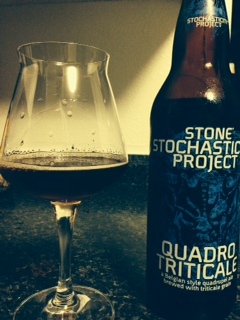 There is no other glass like it, and any beer enthusiast should have at least two in his collection. It's not just a drinking utensil – it's a conversation piece and a collectible as well. You can pick up a pair of these, without labels, from Amazon (+shipping). Update: Unfortunately, the two-piece set seems to not be available any more! There are only a few with logos on them like Firestone Walker, and they are always low in stock. I just did a search online, and could not even find a good place to buy these, other than from 3rd party sellers on random sites. I stumbled upon this post doing research on the TeKu glass. This post is absolutely awesome and I was hoping it would be okay if I linked to this post on my website. I’ve been looking through the site a bit and the content looks awesome. I’ll definitely be reading some of the posts. Keep up the great work! Thanks Garret! It’s an awesome glass, and I use it all the time – more so than any other glass in my collection.